Hier ist das finale Programm des diesjährigen Prophecy Festes. Es wird stattfinden in der Balver Höhle, einer natürlichen Höhle aus dem Steinzeitalter, ein sicherlich unvergesslicher Rahmen für Künstler und Zuschauer. Hypnopazūzu – David Tibet (Current 93) & Youth (Killing Joke) – first concert in Germany. The Vision Bleak – special performance with a classical ensemble of strings, percussion and vocals. Dornenreich – exclusive acoustic history set. Dool – exclusive set with additional musicians and singers. Hexvessel – extended performance with implemented acoustic set. Spiritual Front – special „Armageddon Gigolo“ set for Prophecy Fest 2017! Sun Of The Sleepless – Schwadorf’s (Empyrium/The Vision Bleak) first concert since 1999, second ever. The Moon And The Nightspirit – special show with enhanced line-up. Lotus Thief – European premiere. Soror Dolorosa – performing „Severance“ in its entirety for the first time & presenting their the new album „Apollo“. GlerAkur – the band surprised us and blew us away with their performance at Prophecy Fest 2016. It was an easy decision for us to invite them again. NOÊTA – their first concert outside Scandinavia at this year’s Prophecy Fest! 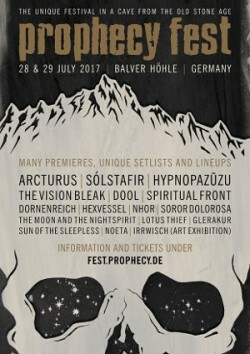 Nhor world premiere performance at this year’s Prophecy Fest! Irrwisch – art director and exhibition.